This trip to South and Central America was a 30 day cruise aboard Holland America’s flagship ms Rotterdam. My full itinerary is listed below in sections – feel free to click on what interests you, however if you click on the top-most item, there are links at the bottom of each page to take you to the next destination – from beginning to end. This is the best way to explore the whole trip. I encourage you to read all the details about this trip, including photos, video, maps and advice. Click on the link below that interests you, or start at the top and work your way through them all! I was browsing the Holland America website looking for inexpensive cruises in a couple of areas – either the Mediterranean or South America. Why choose this cruise? The same two reasons for selecting our last cruise: an interesting itinerary and low cost. We embarked in Ft. Lauderdale, Florida, stopped in 16 ports of call, transited the Panama Canal, and disembarked in San Diego, California. We visited a total of 10 countries in 30 days, of which five countries were new for me. The Rotterdam stayed in Lima for three nights, giving us time to travel across Peru to see Machu Picchu – the highlight of the trip. Machu Picchu has always been on my list of places to see, so that finally happened on this trip, since we spent a total of 5 days in Peruvian ports. The shore excursions to Machu Picchu offered by Holland America were fully booked by the time we decided to take this cruise, so we booked a private group tour (just my two friends and myself) with a third party travel company with experience sending clients to Machu Picchu. Bestway Tours and Safaris is a travel company based in Vancouver, Canada who is well-established and has the experience to provide us with a customized tour of both Machu Picchu itself as well as the Sacred Valley. This particular cruise offers unbeatable value running at under US$100/day/person based on double occupancy. I am traveling solo, however even with the Single Supplement and a modest cabin upgrade, the cruise portion of this trip costs me only about $175/day – about half the usual cruise rates. I budgeted under $300/day for the whole trip, including airfares, the Machu Picchu excursion, hotel in Ft. Lauderdale, and a generous allowance for fun aboard ship. All the major costs of this trip are priced in US$. The US Dollar was weak as compared with the Canadian Dollar when I booked, so I gained a few percentage points when I actually paid for the trip! I booked through the travelocity.ca online travel service, since I received Holland America’s Flash Rate. This reduced the fare even further, by several hundred dollars. 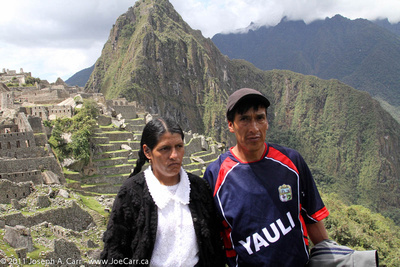 By booking our Machu Picchu excursion through a third party provider, we only paid about 2/3’rds the cost of the excursion supplied by Holland America, and our arrangements included an extra day in Cusco. So we received twice the value. This was a wonderful trip. Holland America is a cruise line which continues to provide the personal touches for its passengers, despite the major cutbacks in service being implemented across the cruise ship industry. My friends and I feel we were spoiled while aboard the Rotterdam. 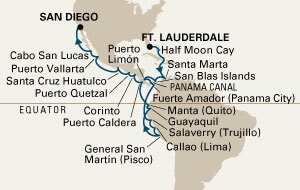 The highlights of the trip for me have to be Machu Picchu and transiting the Panama Canal.